Petra Anderson, one of the 58 people injured in the movie theater shooting in Aurora, Colo., is undergoing a 'miraculous' recovery, said her sister, Chloe, and her mother, Kim. While her recovery has been remarkable, the family is struggling to pay their mounting medical bills. Kate Snow's full report on how Petra Anderson's family and other Aurora survivors are struggling with their growing medical bills airs Thursday, July 26 at 10pm/9c on NBC's Rock Center with Brian Williams. AURORA, Colo. -- Petra Anderson, one of 58 people injured in the Aurora movie theater attack, is lucky to be alive. Anderson, a 22-year-old aspiring music professor, was hit by a shotgun blast during the assault that killed 12 people. Three pellets struck her arm and one rocketed through her head, but it missed the brain's many blood vessels and key sections controlling vital functions, according to her doctor. “If the pellet had wavered a millimeter, really in any direction from what it actually took, then she would have likely either died or been severely injured,” said Dr. Michael Rauzzino, a neurosurgeon at The Medical Center of Aurora who operated on Anderson to remove the pellet. 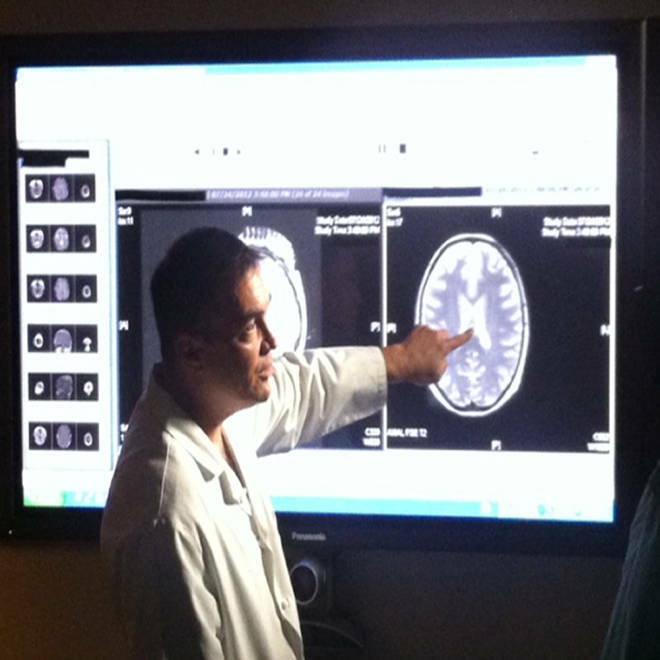 “I would say this is definitely a miracle,” he said, while showing an MRI of Anderson’s brain. The MRI reveals a faint trace of the pellet’s path after it entered the left side of Petra's nose, broke through the front of her skull, and passed through her brain, before lodging in the back of her head. In New York City, a bell was rung in honor of the victims, and in Aurora, Colo., there were more memorials for those who could not escape the gunman's shooting rampage. NBC's Miguel Almaguer reports. Among the dozens hurt in the attack on a midnight premiere of the latest Batman movie, “The Dark Knight Rises,” injuries vary widely. Some were treated for their wounds and could walk out of the hospital. Others are still fighting for their lives. And yet others, like Anderson, who plays violin and piano, are dealing with a range of injuries that could require long-term treatment, and perhaps, totally alter their futures. Doctors performed two procedures on Anderson: one to remove the pellet from her brain and the other to close the hole in her skull where the pellet entered her head. A large hole was left behind that had to be fixed or it could have led to complications in the future, such as leakage of brain tissue or liquid, Rauzzino said. Dr. Michael Rauzzino, a neurosurgeon at The Medical Center of Aurora, talks about the path of the shotgun pellet through Petra Anderson's brain, noting how it missed many blood vessels and centers that control key functions. Rauzzino denied news reports stemming from a pastor’s blog that Anderson had a congenital defect in her brain creating a void, or hole, the pellet shuttled along to save her life. Since last Friday, Anderson’s family experienced the ups and downs of dealing with major trauma to a loved one. “Everything changed, and I could not get past this idea that she had gotten shot in the head. I know that the first big fear I had wasn’t actually her dying, but her losing things in her life that have been really important,” such as her music, said her boyfriend, Austin Hogan, 23, as he broke down into tears. But the fact she escaped death “was such a source of hope for moving forward, I think, for all of us, and we really rallied around that,” he said. Anderson was planning to enter the University of Maryland this fall for graduate studies along with Hogan. The middle child of three siblings, she had come home to Aurora to spend time with her mother, Kim, who was diagnosed with terminal breast cancer in May and is to begin experimental treatments in a few days. 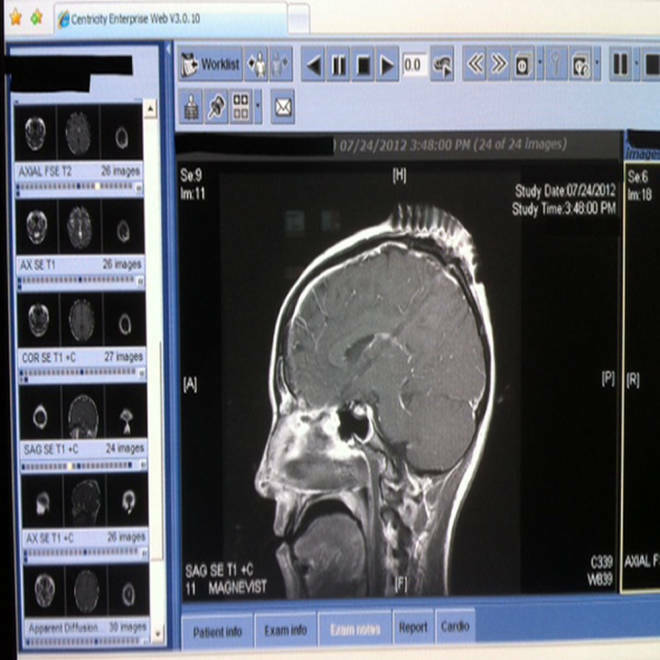 An MRI shows the faint upward track of the shotgun pellet through the middle of Petra Anderson's brain. Adding to the family’s worries are the medical bills: Petra’s insurance won’t likely cover all of her expenses and her mom’s insurance won’t pay for her alternative cancer treatments, Chloe Anderson said. So, working with friends, she and Hogan set up a fundraising campaign to raise money for them. But the campaign won’t just raise funds for mother and daughter: part of it will also go to other victims. The money will be funneled to the Colorado Organization for Victims Assistance. Also, three of the hospitals in the area that treated victims announced Wednesday they will forgive some or all of the medical costs associated with the attack. “If you have a blessing, it’s great to have it, but it’s even better to be able to share,” Chloe Anderson said. In the days since Anderson was shot, she has been eating, smiling, and telling the cerebral jokes she is known for, her sister said. She also took a stroll around the intensive care unit but has been in pain, a bit groggy from the medicine, and her loved one have noticed some deficiencies, such as it taking her “a little while to come to whatever it is that she is saying,” Chloe Anderson said. Chloe Anderson, left, of Aurora, Colo., and Petra Anderson's boyfriend, Austin Hogan of Marin County, Ca., talked about some of her injuries as she recovered in a nearby hospital. She hasn’t asked about what happened at the theater, where she had gone with two friends (one survived being shot several times; the other was uninjured), and her family didn’t want to cause her any additional stress by bringing it up. As Anderson’s family spends their days immersed in her recovery, which they update on an increasingly popular Facebook page that has in turn provided them emotional support, Chloe Anderson said she doesn’t think much about the alleged gunman. NBC News' JoNel Aleccia contributed to this report. NBC News' Kate Snow presents a photo montage of powerful images captured throughout the weekend tragedy as the city of Aurora, Colo., begins to heal from a shooting massacre that claimed 12 lives.